If you’re reading this on a phone, tablet or laptop, instead of paper, you’re part of the digital revolution that is transforming society. The shift to electronic documents and data in all areas of life is one of the key economic developments of this century, bringing new efficiencies, cost savings and opportunities far beyond anything that could be achieved with paper records. That shift is about to hit commodity trading, which has traditionally relied on vast paper trails to execute, authenticate, and process each transaction. Digital technologies like blockchain, the distributed ledger technology best known for its association with cryptocurrency Bitcoin, are creating new options for streamlining and simplifying paper processes, and for disrupting long-established business models. Blockchain has attracted serious interest from some of the biggest names in commodity trading, like Gunvor and Mercuria, as well as oil-and-gas majors like BP and Shell, and big banks like Societe Generale and ING. But blockchain also creates opportunities for smaller players by potentially reducing the cost of trading, making it cheaper to enter a market. Regulators are also interested in how blockchain can help them make markets more transparent and so more efficient. This again helps new entrants. In Fujairah, for example, S&P Global Platts uses a blockchain platform to collect and publish weekly aggregated oil terminal stock levels on behalf of the Fujairah Oil Industry Zone authority and data committee FedCom. This is one of the first commercial live applications of blockchain in the energy sector. Trade finance, which underpins all global commodities trading, is another sector that blockchain could transform. Increased transparency in trade workflows could make fraud much easier to detect, but a secure blockchain system with trusted counterparties also threatens the role of banks as trusted intermediaries. In electricity, the role of utilities and grid operators is threatened by the shift to decentralization, as more and more distributed energy sources, such as rooftop photovoltaics and battery storage in electric vehicles, come into play. Blockchain can support this decentralization by enabling peer-to-peer trading in microgrid communities between prosumers – retail consumers who also produce small quantities of power. It is blockchain’s ability to process frequent micro-transactions that helps to make such trading technically possible. But physical and regulatory constraints mean that utilities and grid operators will still have major roles in delivering power for many years to come. Virtual peer-to-peer power trading, however, which sits on top of existing structures, is possible and potentially viable now. One of the challenges for both virtual and physical peer-to-peer trading is pricing this power. S&P Global Platts is bringing its years of experience as a trusted price reporting agency to bear in solving this problem. It is working with the Port of Rotterdam on a project to offer transactive pricing for peer-to-peer power trading in a microgrid community of port-side businesses. Blockchain faces many other challenges to becoming a big part of commodity trading, including cost, privacy, liability, and achieving mass participation. It is also just one part of a new digital trading infrastructure, with artificial intelligence, machine learning, and robotic process automation all set to play a role. It goes beyond the scope of this report, but S&P Global is active in all these areas, including through Kensho Technologies, which it bought in 2018. I’m excited by the opportunities blockchain creates for commodities trading, and this report is an excellent introduction into what they are. Blockchain is a distributed ledger technology that could make trading commodities simpler, cheaper and more transparent. It is best known for its association with the cryptocurrency Bitcoin, but it can be used in any process involving transactions and exchanging data. Blockchain works by verifying and recording transaction data in a permanent way on a single, secure digital ledger shared by trusted counterparties. It creates a system where parties can connect directly with each other, without the need for intermediaries like banks, brokers or utilities, for example. Pilot projects using blockchain to support commodities trading are springing up all over the world, but there are very few live commercial applications as of mid-2018. Cutting post-trade processing costs is one of the main potential uses of blockchain in commodity trading, with savings of up to 40% across operations, accounting, settlements and IT, according to blockchain developers. Big energy traders are backing blockchain post-trade projects, like Vakt for oil and OneOffice for gas, that are expected to launch in the coming months. Wholesale peer-to-peer trading is another application being developed by big European gas and power companies in the Enerchain project. The partners hope to enable large-scale trading, making the project unique in its focus, size, and disruptive potential. Exchanges will remain core to wholesale power trading, however, as trade matching is only one part of what exchanges offer, according to Peter Reitz, CEO of the world’s largest electricity exchange, EEX. But blockchain could help link the wholesale markets to smaller regional and local ones. Prosumer power drives blockchainenabled peer-to-peer trading at the micro-scale, enabling households in a microgrid to exchange small quantities of locally-sourced power directly with each other. This challenges the traditional utility and grid business models, but regulatory constraints are likely to limit development in the near term. Singapore is emerging as a strategic base for digital startups in Asia, with several of these developing blockchain platforms for energy and commodity businesses. With a digital-friendly government and regulator, Singapore is poised to show what’s possible under the right conditions. Derivatives trading is also a key target for blockchain developers. Blythe Masters, CEO of Digital Asset, sees blockchain’s ability to offer a common record of transactions as enabling huge efficiency gains for trading in any asset class, whether that is a commodity derivative or an interest rate swap. Tackling trade fraud, particularly trade-based money laundering, is another activity blockchain can help with. This is a particularly difficult financial crime to track and investigate, but blockchain’s common record could help parties spot invoice irregularities, carousel transactions, and unusual shipping routes, for example. Taking stock of storage levels and other key supply-and-demand data helps make markets more efficient. Blockchain can be used to provide aggregated data while fully respecting individual commercial confidentiality. It could also be used to run auctions and electronic tenders for physical bulk commodities, for example. Breaking the rules might be needed to help blockchain develop, particularly for peer-to-peer trading at the household level. Developers are seeking regulatory waivers to test concepts that are not allowed under systems designed for centralized energy production. Keeping safe from cyberattacks should be a priority for every business, according to Tobias Feakin, Australia’s first Ambassador for Cyber Affairs. He argues governments and the private sector must work together to mitigate the risks, safeguard cross-border digital trading, and avoid a “digital divide” splitting global trade. A reality check is always useful as blockchain moves from the initial hype and proof of concept to having to prove commercial value at scale. Cost, privacy, and liability are all potential deal-breakers, while other technologies such as artificial intelligence and machine learning may compete as well as complement. Blockchain works by verifying and recording transaction data in a permanent way on a single, secure digital ledger shared by trusted counterparties. Blockchain emerged in 2009 as the distributed, decentralized digital ledger underpinning cryptocurrency Bitcoin, recording transactions in an immutable way. It works like this – an individual, or a machine, registers as a member of a blockchain, which can be public, like Bitcoin, or private, like a street of householders or a group of traders. The individual/machine can then transact with other members registered to the blockchain. Computers – nodes – on the blockchain’s peer-to-peer network check each transaction, using the same consensus algorithm, to agree that the transaction is true and valid. Verified transactions are then added to other transactions to create a new block of data that is added to the existing chain of blocks. This creates a permanent data entry in the digital ledger. No one can change the ledger – it is immutable. It is shared with all members at all times and, if the blockchain is public, anyone can become a member. Since the initial concept, developers have created automated code-based processes, known as smart contracts, which can interact with and update the data on the ledger without direct human intervention. Bitcoin is a public blockchain that as of mid-2018 was still using a “proof of work” consensus algorithm to verify transactions. Proof of work relies on computers solving cryptographic puzzles for the right to add the next block in the chain. This “mining” method uses a lot of electricity to run the computers and is slow. Developers are looking at alternative consensus algorithms for the private, permissioned blockchains being explored for commodity trading applications. For example, the Energy Web Foundation is working on an opensource, scalable blockchain platform called Tobalaba, specifically designed for the energy sector, which uses a proof of authority consensus algorithm to verify transactions. The EWF is a global non-profit organization supported by a wide range of energy companies and developers, such as California’s Pacific Gas and Electric, Japan’s Tepco, Norway’s Equinor and energy major Shell. EWF’s proof of authority algorithm uses a specific group of nodes – computers on the peer-to-peer network – to validate transactions. These authority nodes, or validators, are governed by a smart contract. The aim is to verify transactions more quickly using less energy than with proof of work. Another consensus algorithm type is proof of stake, where a set of potential validators take turns to propose and vote on the next block. The weight of each vote depends on how much of the blockchain’s base cryptocurrency the validator owns and has put up as a locked deposit. Again, this is less-energy intensive than a proof of work consensus. A fourth type is practical byzantine fault tolerance, which can be used on the private, permissioned Hyperledger Fabric blockchain platform. PBFT enables replica transaction files to communicate with each other, so that if the first copy becomes corrupted it can be replaced by the replica. to create a new block of data. Digitizing post-trade processes for commodities could cut costs by up to 40% across operations, accounting, settlements and IT, according to blockchain developers. Modern commodity trading still relies heavily on manual, cross-checked, paper-based administrative tasks to process individual trades through to settlement and delivery, but that looks set to change with the advent of new IT options, including distributed ledger technologies like blockchain. “The question of whether blockchain will change the way we do business is already answered for BP,” Iain Lawson, BP’s head of structured products for the Eastern Hemisphere, said at the S&P Global Platts Digital Commodities Summit in Singapore in July 2018. “There’s a full acceptance in the front office of any trading room in Singapore that blockchain will change not just how we trade, but potentially what we trade and who we trade with,” he said. BP is a founding partner of Londonbased consortium Vakt, with other oil majors Equinor and Shell, trading houses Gunvor, Koch and Mercuria, and banks ABN Amro, ING and Societe Generale. Vakt is developing a blockchain-based platform for post-trade processing that is intended to eliminate paper, improve efficiency and transform trade finance options. It is focusing on oil to start with, looking at North Sea crude, AmsterdamRotterdam-Antwerp product barges and US pipeline crude. The plan is to go live in November 2018 with processing BFOE North Sea crude trades for consortium members, Vakt’s interim CEO John Jimenez told the conference. It will follow this by expanding to include pioneer users – organizations that are ready to engage in a blockchain service. By the end of first-quarter 2019 it hopes to make the service available to other potential participants. Vakt’s ambition after these three initial markets is to scale up and enter many other markets, like Singapore, the rest of Asia, the Middle East and US natural gas, Jimenez said. “The first challenge is to prove that we can do this at enterprise grade and bring it to operation this year,” he said. While Vakt is focusing first on oil, Canadian technology company BTL is developing a post-trade reconciliation service for natural gas called OneOffice, using its Interbit blockchain platform. BTL is working with Eni Trading and Shipping, Freepoint, Gazprom Marketing & Trading, Mercuria – which is also a partner in Vakt – Petroineos, Total and Vattenfall on a service that could cut back office costs for processing wholesale gas trades by 30-40%. “We believe there could be even greater cost savings, given the reduction in technical infrastructure that’s required to build and support a blockchain application,” BTL director Brian Hinchcliffe told S&P Global Platts. The service aims to enable companies to deal with mismatched trades more efficiently. “A trade reconciliation blockchain application can streamline this process by raising disputed trades at the outset and therefore save a huge amount of time, thus enabling faster payment and settlement times, larger trading volumes and an immutable audit trail,” he said. BTL’s Interbit blockchain platform is designed to allow any application using it to scale to enterprise requirements. As of mid-2018, the trade processing service was still in the testing phase with the initial partner companies. “Any future collaboration is likely to look very different to this current phase as we move towards a production live application,” Hinchcliffe said. Accessibility: Blockchain improves accessibility by storing data in an encrypted, digital distribution ledger that can be accessed by every party in the blockchain. Scalability: The blockchain can be scaled up or down based on the number of parties involved, without any increase in paperwork, thereby improving the system’s efficiency. Digital verification: Implementing electronic knowyour-customer (e-KYC) activities for the parties involved is viable and helps detect potential red flags. Security: Using cryptography and key-based encryption, it is impossible to tamper with the documents and contracts within the blockchain. Ease of regulatory validation: The relevant regulator can be given access to the blockchain to verify processes at every step of the transaction. More than 35 companies are involved in the Enerchain wholesale trading project, including big European gas and power traders such as E.ON, Enel, Iberdrola, and Vattenfall. But, with no fixed launch date set for commercial trading, Enerchain’s challenge to the existing order remains a vision for the future. As of mid-2018, the companies involved still had to agree to governance, form a legal entity, and then actually start trading in earnest. The software itself is evolving and has limitations in transactional speed. Several participants are there to observe and learn, and it remains to be seen who among the big beasts are really serious. While some participants say their interest in Enerchain is more about understanding the potential for blockchain, not spearheading a revolution, others are genuinely keen to turn concept into reality. Once a deal is executed on Enerchain, it is pushed to the electro-technical information model systems of the company, from where it goes down the traditional reconciliation cycle. Peter Reitz, CEO of EEX, the world’s largest electricity exchange, talks to S&P Global Platts about how blockchain is an opportunity, not a threat. How can EEX make use of blockchain? Looking at blockchain – where do we come from? We ask ourselves how we can improve our services as an exchange and clearing house in the context of the challenges in the energy industry, which are mainly referred to as the 3 Ds – decentralization, digitalization and decarbonization. In doing so, we think about exposure to price risk and risk management, and where we see that changing, we see opportunities for EEX Group. In this context, we see blockchain as one technology among many others. As far as the application of blockchain technology in the financial sector is concerned, our mother company Deutsche Boerse is involved, looking into applications in dialogue with industry stakeholders. Will P2P wholesale trading make exchanges redundant? Peer-to-peer wholesale power market trading – for example, trading on the day-ahead market – would not make sense. This is because the core function of the day-ahead market is to gather liquidity by aggregating the total power production and consumption, on a systemic level, but not on an individual level. On the power derivatives markets it’s all about providing attractive prices for traders based on a large liquidity pool. But an exchange is more than a matching engine. Fundamentally, exchanges create transparency through reliably calculating and publishing prices and volumes. In addition, exchanges have further core functions, such as the admission of trading participants, market surveillance, the implementation of regulation, and risk mitigation through the central clearing counterparty. In a nutshell, we see blockchain not as a threat, but as an opportunity. And I’m convinced that the core function of exchanges and central counterparties are valid also in the future. 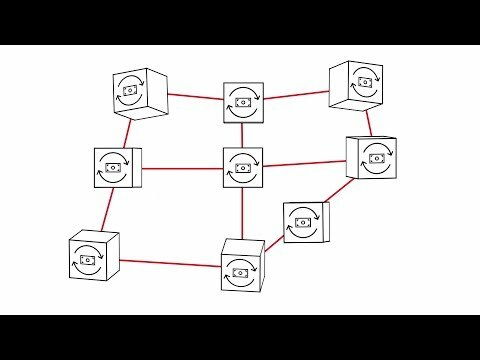 How can blockchain connect microgrids to wholesale markets? One initiative in this field is the cooperation of EPEX SPOT, the power spot exchange within our group, with the Brooklyn-based startup LO3 Energy. LO3 develops so-called microgrids at the neighborhood level using blockchain. This implies that prosumers producing electricity through individual devices such as solar panels are connected to each other, enabling them to trade the produced electricity peer to peer using blockchain technology. The partnership of EPEX SPOT and LO3 aims at plugging local microgrids into the wholesale power market. This will increase liquidity and give more market opportunities. It will determine a real value for the electricity generated in the microgrid. Participants of the microgrid can sell excess electricity or buy electricity in case of shortfall or low prices, and consumption patterns can be adapted according to the wholesale price signal. How could blockchain change European power markets? We observe many initiatives for peer-topeer trading, but on a very local level without influencing power trading on a European wholesale level yet. If we look beyond the pure trading layer, there are fields in which blockchain could create added value. For example, this could be secondary services such as a registry service for emission allowances or guarantees of origin. By using blockchain for tracking renewable power generation at a local level, the documentation of power production could become more reliable. What other digital technology changes do you see coming? Trends such as digitalization, decentralization and decarbonization are shaping the energy trading of the future. Digital technology changes that will arise are automated trading solutions and artificial intelligence. Some of these developments are already in use in the energy market, although on a completely different scale than in the financial market. Looking at algorithmic trading, it’s about electronically implemented trading strategies that are executed automatically. We see this happening on the energy markets today, for example on the power spot market, on which participants use the automated marketing of renewable power plants. The handling of big data is another main topic for the future. Within EEX Group, we’ve established a groupwide “think tank” to look into these topics and discuss opportunities to be well prepared for future challenges. Read our full series of reports to learn more about the technology, challenges and opportunities ahead as blockchain enters a critical development phase.